Being a frequent flyer, I occasionally run into problems like lost luggage and you can always count on loosing your luggage at the absolute worst time. I am an international traveler and also spend a great amount of time overseas so I am open to all cultures and backgrounds, but I have to agree with Delta Airlines that call centers in India just don't cut it. I can deal with these call centers if it's for something that isn't very important or if I am not in the middle of a crisis, but the last thing you want to have to deal with at 1 in the morning, after a 10 hour delay and you find out your luggage is missing is to have to try and communicate that to a call center halfway around the world, from call center reps who are barely understandable and more times then not, down right rude. Apparently I am not alone. America's Delta Airlines, the world's largest airline, has announced to close down its Indian call centers, in a decision the carrier's officials say was driven by poor customer feedback. Media reports said Richard Anderson, the airline's chief executive, told employees in a recorded message on Thursday night that Delta had stopped forwarding calls to India in the first quarter and would be bringing the function back in-house in the US. "The customer acceptance of call centers in foreign countries is low and our customers were not shy about letting us have that feedback," Anderson said. Delta was not the only airline to pull out of India, United Airlines pulled the plug on India's call center a couple of months ago citing poor customer service and moved the operation to the Philippines which has a much higher standard of quality. 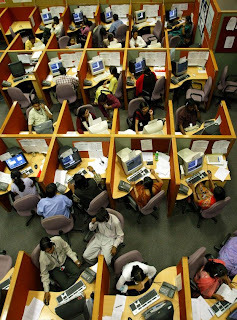 Delta is moving 80% of the call center jobs back to the U.S., the other 20% also going to the Philippines. that's good news as there'll be better business opportunities for my country, Philippines.